The 286 km distance from Berlin to Hamburg in Germany was covered by the “Flying Humburger” in 2 hour 10 min at average speed of 132 kmph. Trains, called Streamliners, covered the 1,633 km distance from Chicago to Denver in US in 16 hours, achieving average speed of 125 kmph. 80 years later on IR, only one train runs at average speed more than 100 kmph. The Gatiman Express covers the 188 km distance from Delhi to Agra at an average speed of 113 kmph. The next fastest train is much slower: The New Delhi-Bhopal Shatabdi Express, which covers the distance of 703 km at an average speed of 90 kmph. The fastest train over long distances is the Delhi-Mumbai Rajdhani Express which covers the distance of 1,386 km in 15 hour and 50 min at average speed of 88 kmph. Is the Railway Board trying to divert attention from its dismal failure to raise speed of trains in the country? The speed of trains has been stagnant in the 48 years since 1969, when the Delhi-Howrah Rajdhani Express (maximum speed 130 kmph) was introduced. Now, the Railway Board wants to crash into the club of countries with High Speed Rail (HSR) lines that carry the famous bullet trains (the trains got the name because the nose of the aerodynamically shaped train looked like the tip of a bullet). Certainly the country is not being given the full picture, particularly the fact that there is the sensible option of adopting conventional high speed trains that would meet the country’s requirements of higher speed. The question that should be asked to understand why India does not need bullet trains is this: Why should IR build a high-speed rail (HSR) line at a whopping cost of Rs 217 crore/km (Rs 1,10,000 crore for a distance of about 508 km from Ahmedabad to Mumbai) which will take 2 hours and 8 minutes if it is possible to build a conventional high-speed line at one-eighth of this cost (Rs 25-30 crore/km) which will cover the distance in 2 hours and 50 minutes with tilting trains (average speed: 180 kmph) and 3 hours 25 minutes (average speed: 150 kmph) with normal trains? Clearly, the difference in travel time is not very significant despite the tremendous cost difference. Both these comparisons include the cost of trains. A measure of how cost-effective conventional high speed is that while it will cost about Rs 4,35,000 crore to build a 2,000-km HSR line from Delhi to Chennai, it will be possible to upgrade the entire 20,000-km network of IR’s trunk routes (average cost: Rs 12 crore/km) to run high-speed trains on the existing conventional lines, and expand the existing network of conventional lines by building more than 10,000 km of new double-line routes (average cost: Rs 15 crore/km) on the busiest of the trunk routes to segregate fast trains from the slower ones. The upgraded existing lines will carry high-speed passenger trains (maximum speed 160-240 kmph) and fast freight trains (maximum speed 120-160 kmph). With this IR will be able to provide fast daytime intercity travel over 200-600 km distances and comfortable overnight travel on longer distances up to 2,200 km (see box, ‘Journey time and speed of trains’). With this upgradation and new line construction IR will also have sufficient capacity to meet the requirement of next 30-50 years. From 1985 to 2005, IR had made massive investment to upgrade its trunk routes (see box: ‘IR’s plan to upgrade the existing trunk routes’). By 2005 it had everything in place to raise speed to 200 kmph from the then existing 100-130 kmph in stages over the next five to seven years with benefits starting to accrue from the second year itself. But IR repeatedly failed to carry out the last-mile work (easing of some sharp curves, strengthening some bridges, improving track geometry to tighter tolerances, cab signalling, and fencing in congested areas to prevent trespassing) that were required to complete the upgradation and unlock the full potential of its existing network. In March 2007, as China was completing upgradation of its network to 200 kmph before moving on to build new HSR lines, the author submitted to the railway board a study of how railways across the world had upgraded and expanded their networks using different approaches that suited their geography, demography and level of economic development. The then chairman of the railway board had shown keen interest, but he was to retire shortly. Eventually, nothing concrete happened to put back upgradation of the existing network as IR’s top priority. Much of the information contained in this article is from that report: the information has been updated to account for the recent developments. The author would like to clarify that this article is not specifically about the Ahmedabad-Mumbai HSR project to run bullet trains. The railway board has justified this project on the ground that it will be financed by Japan on very favourable terms to India. Japan reportedly will give a soft loan of Rs 88,000 crore which will cover 80% of the project cost, which is estimated at Rs 1,10,000 crore. The loan is at a negligible rate of interest – 0.1% – and will be repayable over 35 years after a moratorium of 15 years. What is worrying is that IR is carrying out feasibility studies for new HSR lines totalling about 10,000 km in length all across the country. So the important question that this article intends to address is: should India build more HSR lines? For a full understanding of why India does not need bullet trains (HSR lines), a rather intriguing question that demands an answer is why Japan, France, Germany, Spain, China, South Korea, Taiwan and some other countries built HSR lines instead of building conventional high-speed lines even though the bullet train lines offer only marginal benefit in terms of journey time and line capacity. To get an insight into this, it is necessary to look at the historical development of HSR. Within two decades after the end of World War II in 1945, railways rapidly declined from a position of near total dominance of domestic travel to a marginalised role in the developed countries of Western Europe, the USA, Japan, Australia, Canada, and Japan. As these countries witnessed explosive industrial and economic growth, there was need for faster inter-city travel for better mobility. But the railways failed to bring about technological improvements to sufficiently raise the speed of trains to meet the demand for better mobility. While the railways failed to increase the speed of trains, the airlines saw rapid growth spurred by technological breakthroughs like the birth of jet planes and improved air navigation. Travel by road improved greatly in terms of safety, reliability and comfort. With rising affluence more families could own motorcars and travel by road also became safer compared to the conditions in the 1920s and 30s. By the end of the 1960s the share of railways in passenger transport had dropped from more than 80% to less than 10% in most of these countries. In the US, passenger travel by train was nearly finished. HSR was developed between the 1960s and 80s in Japan, France, Germany and Italy to meet specific needs. Rapid growth of the air and road modes of transport led to heavy congestion on roads and airports, a serious problem of air pollution, and heavy dependence on imported oil. Each of these countries was a major oil importing country at that time. Thus, the aim of developing HSR technologies in Western Europe and Japan was to bring back to railways the passenger traffic that it had lost to airplanes and automobiles and thereby also address the problems of congestion on highways and airports, pollution and dependence on imported oil. Reducing dependence on imported oil was crucial because road and air transport accounted for about 80% of the total consumption of oil. Cartelisation by the oil producing countries of the Middle East and elsewhere (OPEC was formed in 1960), and the Arab-Israel wars, which escalated into the bloody conflict of 1973, created a situation of rising oil prices and uncertainties in supply. Prices of oil in the world market skyrocketed from $3 per barrel in 1973 to $35 in 1980, a tenfold increase in seven years. The main reason why Japan, France, Germany, Spain and Italy, and later South Korea and Taiwan, decided to build new dedicated HSR lines instead of conventional high-speed lines is topography and not high speed. Most of Japan is in mountainous terrain or undulating topography (gently sloping hillocks and valleys). The trunk routes in France, Germany, Italy and Spain also have such terrain in large portions. 1983-84: IR prepared plans to raise speed on the trunk routes from 130 kmph to 160 kmph. Track and other infrastructure began to be upgraded. RDSO, the research arm of IR, was given the task of upgrading existing locomotives, coaches and wagon indigenously with the help of UNDP and other global developmental agencies. 1993-95: RDSO carried out a detailed study on the prototype rolling stock, and submitted its report for raising speed to 160 kmph on Delhi-Kanpur and Delhi-Bhopal lines. Upgradation of the track and other infrastructure had been largely completed on these routes. In September 1994, the railway board wrote to RDSO to complete necessary field trials and submit report for raising speed on the above routes. The board wanted to raise speed on these routes in the next year (1995). RDSO successfully carried out field trials and submitted its report, but the board deferred speed-raising. 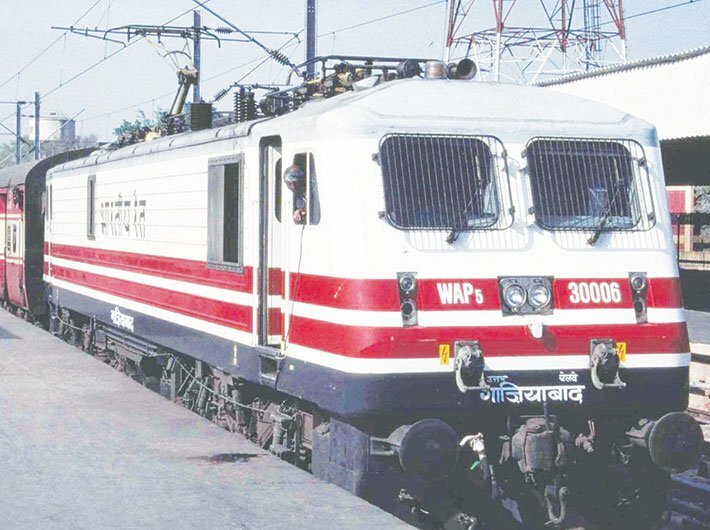 1995-2005: IR acquired ABB electric locomotives and LHB coaches which could run at 160 kmph on the existing lines and were upgradable to 200 kmph. With transfer of technology agreements with the suppliers, production units of IR started manufacturing these locomotives and coaches. Wagons capable of running at 100 kmph were also manufactured. Financial viability of an HSR line as well as a conventional high-speed line primarily depends on the cost of the line and its infrastructure which typically accounts for 85-90% of the project cost. Rolling stock accounts for just about 10-15%. The basic fact is that on routes where a substantial portion of the line passed through hilly terrain or rolling topography, the cost of building an HSR line is not very high compared to the cost of building an upgraded conventional line. The first HSR line was built in Japan. By the end of the 1950s, the existing line from Tokyo to Osaka, which was a meter gauge line, was carrying trains to its full capacity. So, Japan decided to build a new standard gauge line. The Shinkansen line from Tokyo to Osaka was opened in 1964 at a speed of 210 kmph with plans to raise it in future. It was opened weeks before the start of the Tokyo Olympics that year. The line was an astounding success as it managed to take 80% of the total rail and air transport between the two cities. France opened its first HSR (‘TGV’) line, Paris-Lyons, in 1981. Italy opened the Rome-Florence line in 1988. Germany opened the Berlin-Wurzburg line (‘ICE’) in 1991, and Spain (‘AGV’) followed in 1992. These lines were successful in taking a significant market share from the road and air modes of transport. Travel by HSR lines was cheaper than air. Because of affluence and increasing economic growth, most of these lines were carrying 100 to 150 trains in each direction within five to ten years of their opening. More HSR lines were built by these countries to connect large metropolitan cities. About 80% of the total 2,765 km of Shinkansen lines in Japan are in tunnels and bridges/viaducts. Like Japan, the other countries which have built HSR lines also have significant proportions of their trunk routes in mountainous terrain or undulating topography. 67% of China’s first major HSR line (the 968 km long Wuhan-Guangzhou line), 72% percent of the 505 km long Zhengzhou and Xi’an line, and 89% of the Beijing-Shanghai line is in tunnels and viaducts/bridges. 91% of the 345 km long Taipei-Kaohsiung line in Taiwan, and 72% of the 412 km long Seoul-Busan line in South Korea is in tunnels and viaducts/bridges. About 88.3% of the Florence-Bologna line in Italy and about 55% of Germany’s first HSR line from Hannover-Wurzburg is in tunnels and viaducts. About 80 to 90% of the lines crossing the Alps in Switzerland and Austria, traversing from France and Germany in north to Italy in south are also in tunnels and viaducts/bridges. The lines in France, Spain and some other countries use steep gradients to reduce the length of tunnels and bridges, but the proportion of the line on high heavily engineered embankments/cuttings, which are also costly, is higher. So despite different methodologies for negotiating hilly terrain, these countries also preferred to build HSR lines to the conventional high speed lines because the difference in cost of these two types of lines is not very high. The picture is quite different for high speed rail lines in flat terrain because typically in such terrain less than 10% of a conventional high speed line is required to be built in bridges and on viaducts and the rest on normal embankments on ground, but an HSR line has still to be built on viaducts because of technical requirements of maintaining geometry of track to very close tolerances and reducing ground vibrations. 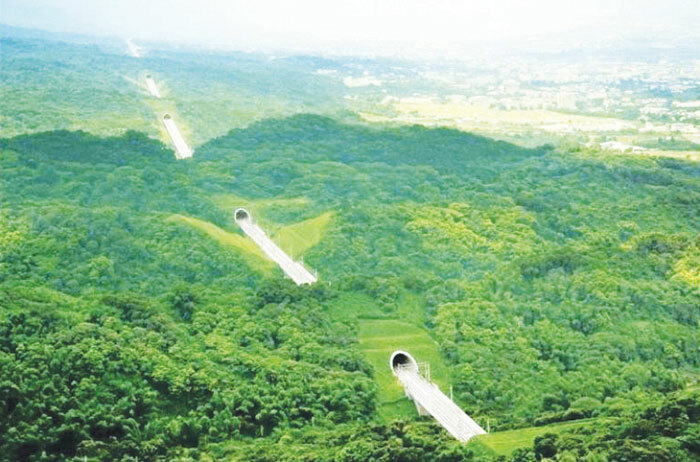 Theoretically, HSR lines can be built on heavily engineered embankments (which are also very costly) instead of viaducts in flat terrain, but viaducts are preferred because by constructing the line on viaducts land acquisition is reduced. Further, in inhabited areas viaducts are preferred over embankment as they reduce the effect of noise on the nearby inhabitants (At speed above 250 kmph aerodynamic noise is more than the mechanical noise of train). It is for these reasons that even though the Ahmedabad-Mumbai line will be passing through flat terrain, yet only 2% of the line will be on ground: 92% of the line will be built on viaducts/bridges and the remaining 6% in an undersea tunnel near Mumbai. A comparison of the actual costs of HSR lines and conventional lines in flat and hilly terrain is given in the box (‘Average costs’). Costs vary from project to project, but the costs given here can be taken as benchmark for a general comparison. China’s vast landmass also has mountainous terrain or undulating topography interspersed with flat terrain in all its regions. Unlike other countries which adopted dedicated HSR lines straightaway during the 1960s-90s, China still does not have that level of affluence. So, it first upgraded and expanded its conventional network of lines. This push culminated in a campaign of raising speed on its trunk routes from 100-120 kmph to 160-200 kmph from 1997 to 2007. This continued till 2010. As China’s economy continued to boom all through the 1990s to 2010, it became clear that the upgraded trunk routes would reach saturation levels soon. So, in 2006 China began building a network of HSR lines which eventually resulted in construction of four north-south and four east-west lines. The last of these lines are expected to be completed this year. But the concept of HSR in China is quite different in one important aspect. The European and Japanese HSR lines generally carry only high speed trains, but the Chinese high-speed lines, called passenger designated lines (PDLs), carry HSR trains as well as conventional high-speed trains (speed 200-250 kmph). Some lines even carry fast container freight trains (120-160 kmph). The idea seems to be that as prosperity will increase, more HSR trains will be run on these lines. While HSR was spreading, tilting train technology was being developed to raise speed on the existing conventional high speed lines from 200 kmph to 240-260 kmph to reduce journey time so that these trains on these lines could compete with air and road for market share. And, these lines have been quite successful in this. Sweden, Italy, Spain, the UK, Switzerland and several other countries, including the US (Boston-New York-Washington line), which did not find the need to build new HSR lines, have raised speed on their existing upgraded conventional lines by introducing tilting trains. In fact, since 2010, oil prices have been falling and look set to remain stable with increasing use of solar power and other alternative sources of energy. Further, low-cost airlines have taken a significant market share. The net result today is that travel by HSR is costlier than travel by low-cost airlines. Reports from Europe and China show that budget-conscious travellers prefer low-cost airlines, while the executives and businessmen prefer HSR trains because of comfort, and lack of hassles of security checks and baggage collection that air travel entails. The ability to read, work on laptops and free Wi-Fi are added conveniences. Decline of the railways in Western Europe and North America did not affect mobility because these countries were by then affluent societies where people could travel by air or personal car. India is a vast country and a developing economy with low per capita income. Distances between the main metropolitan cities are typically 1,000-2,500 km. Millions of students and young professionals have to travel long distances for education, training, and work. Due to regional disparities, millions of daily wagers also find jobs at places more than a thousand kilometres away from their village or town. If IR continues to fail to increase speed of trains, mobility of all but the rich and upper middle class would be severely impaired. Because of the failure to upgrade the existing trunk routes and expand the network, congestion of the existing lines is increasing and has reached levels where it is beginning to impact safety and punctuality. This was highlighted in the public outcry and debates after the Utkal Express accident on August 19 that claimed 23 lives. According to the latest data, utilisation exceeds capacity on 65% of the high-density sections; it is 120-150% on 32% of the sections and >150% on 9% of the sections. India has been blessed with a favourable topography on its trunk routes. More than 90% of IR trunk routes are in flat terrain (Indo-Gangetic plain, Deccan Plateau, Coastal plain, Rajasthan desert, etc.) and the rest 10% is in undulating topography or mountainous terrain (portions of Konkan Railway, Mumbai-Pune line, etc.). Because of this topography HSR/bullet train is totally unsuitable for India. Conventional high-speed lines – which can be formed by upgrading the existing trunk routes – though a little slower than HSR lines are the most appropriate and a much cheaper answer to India’s needs. By concurrently expanding the network and by building additional lines, which will make it possible to segregate fast and slow moving traffic on the key trunk routes, average speed of trains will further increase. Thus, by adopting the conventional high-speed rail option, people in all parts of the country can be provided benefit of fast travel. HSR/bullet train lines are astronomically costly, which a developing country like India can ill afford. It’s time to shift focus to complete the long-pending last-mile works to upgrade the trunk routes to unlock their full potential. If this vast network of lines continues to be ignored, mobility of Indians, barring 5-10% in the top income brackets, will continue to deteriorate with serious consequences for the country’s socio-economic development. Verma retired from the Indian Railway Service of Engineers (IRSE) in 2016.